Simon O’Neal is a hard drinking, womanizing Hollywood superstar. He surrounds himself with people who fawn over him and won’t call him on his reckless behavior. Gail Dimarco was his PR consultant until she sacked him as a client. But after an over-zealous employee intimated that Simon sexually assaulted Gail, they need to get together and do some serious damage control. Simon is in a bitter custody battle for his son, and any more bad press will destroy his already shaky case. To rehabilitate his reputation, Gail marries him and they flee Hollywood for Gail’s hometown of Whiskey Creek. 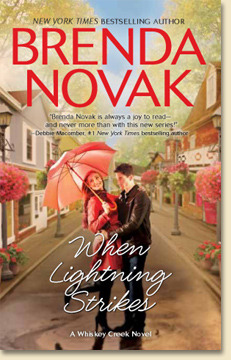 When Lightning Strikes is a cute contemporary romance about a broken man and an insecure woman. Away from the craziness of Hollywood, Simon is able to set his life in order, and in Simon’s arms Gail is feeling treasured for the first time in her life. But someone has other plans and will do anything to ensure that Simon and Gail don’t succeed. This entry was posted in Uncategorized by setaian. Bookmark the permalink.